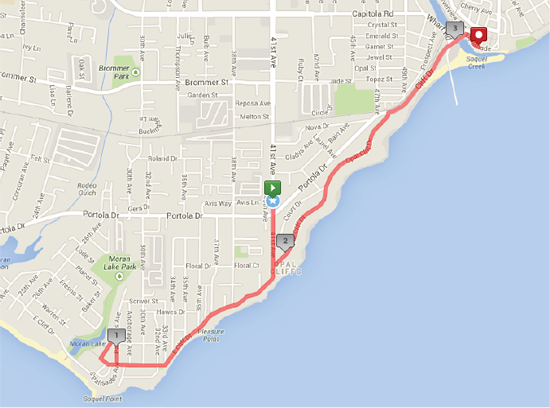 The Surfer’s Path 5k consists of a 3.1 mile run/walk. The event starts on 41st Ave at the gateway to Pleasure Point where surf shops, restaurants and the nearby coast merge to create the regions famous surf culture. The course enters onto scenic East Cliff Drive, offering sweeping views of the Monterey Bay. Participants continue on East Cliff to the turn around at the end of Pleasure Point. Following the turn around, participants travel back past world renowned surf breaks such as 1st Peak, 2nd Peak, Oneill’s House, 38th and the Hook as they continue toward the finish line located in the heart of Capitola Village. The race begins promptly at 8:10 am following the 10k start. The course is managed at a 20 minute per mile pace. Strollers are welcome but must start at the back. There is one course water station located at approximately mile 1.9. Restrooms are available at the start, miles 1, 2 and at the finish line. Post race activities take place in Capitola Village near the beach. Participants pick up their surf inspired finisher shirts, receive post race food, and enjoy the finish celebration!